It’s gone. Posted. Ready to be hung and judged by strangers…. It’s actually quite a nice feeling to finally sit back and not have to worry about getting it finished before the cut off date. Ah, relief! However, this does not mean I haven’t been doing anything. On the contrary I’ve started, unexpectedly, another new quilt as well as completed my August Craftsy BOM. I am happy with how it’s coming together. It’s looking very scrappy, which I intended it to be, and have only four more blocks to make to complete the quilt top. I’m thinking of adding a flying-geese border with the left over 2.5inch squares to frame the main quilt design – I think that might look good. I have no idea what I’m going to do with it when it’s finished; I might stash it away and enter it into a quilt competition some time down the track. 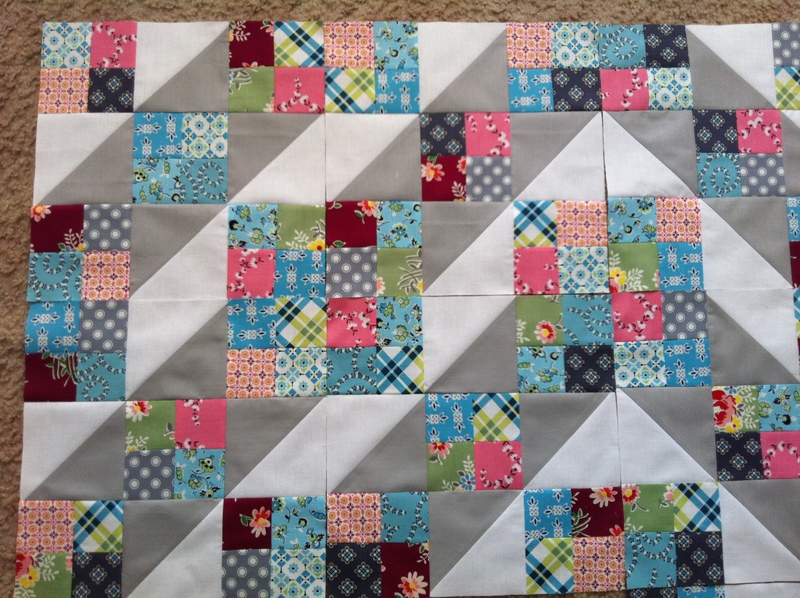 [CLICK HERE] To see my Jacob’s Ladder Quilt Finished! 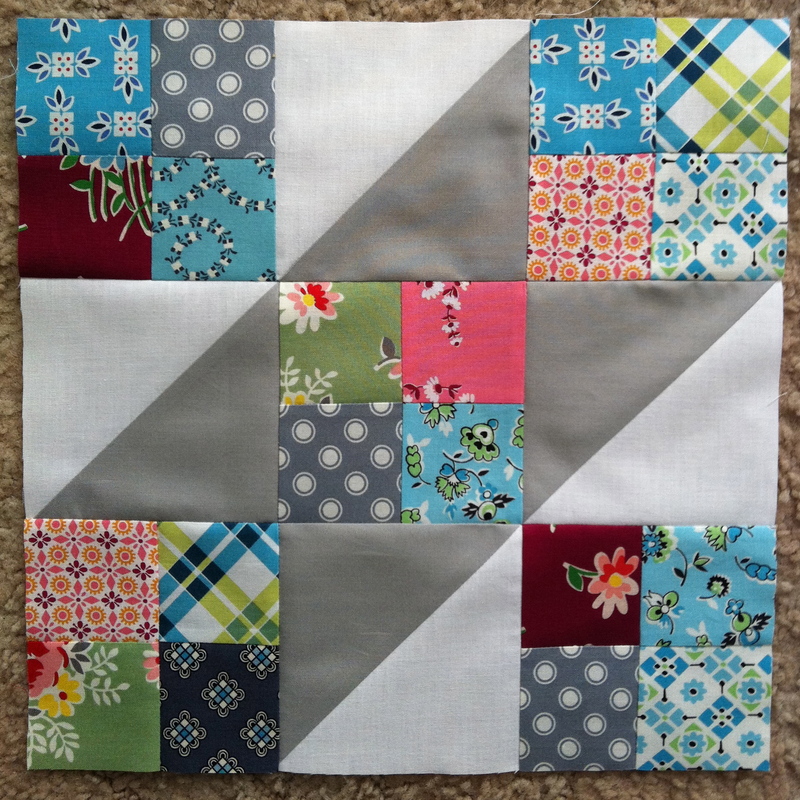 [CLICK HERE] To see my Jacob’s Ladder Block video tutorial! It’s August! (Winter’s almost over! Huzzah!) Which means I had two new Craftsy BOM to make. 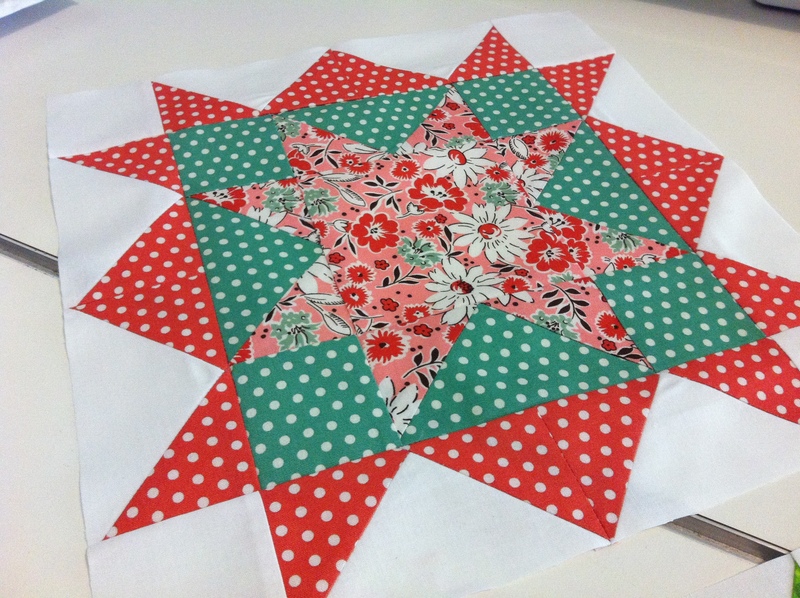 Stars are this month’s theme and I learnt how to make the Ohio Star Block and a Double Star Block. I like the Ohio Star Block best (the top one), it’s simple yet has character. Any-who, I’ve got four more Jacob’s Ladder blocks to make up and then some much needed crashing-on-the-couch-and-watching-mind-numbing-tv to do…. What size quilt did you make? I love the quilt you made. It’s very beautiful and has inspired me to make a Jacob’s Ladder quilt. I really don’t like to quilt but I really want to make this quilt. Thanks for sharing your quilt. When I first saw your Jacob s ladder on Pinterest, I thought you were using postage stamp blocks. As I’m in the midst of making same, I thought oh how clever, if I get bored with all those little squares or just tired of making them, this is a very attractive design. Thanks for the inspiration. I love your Jacob’s ladder. Hi Amanda. 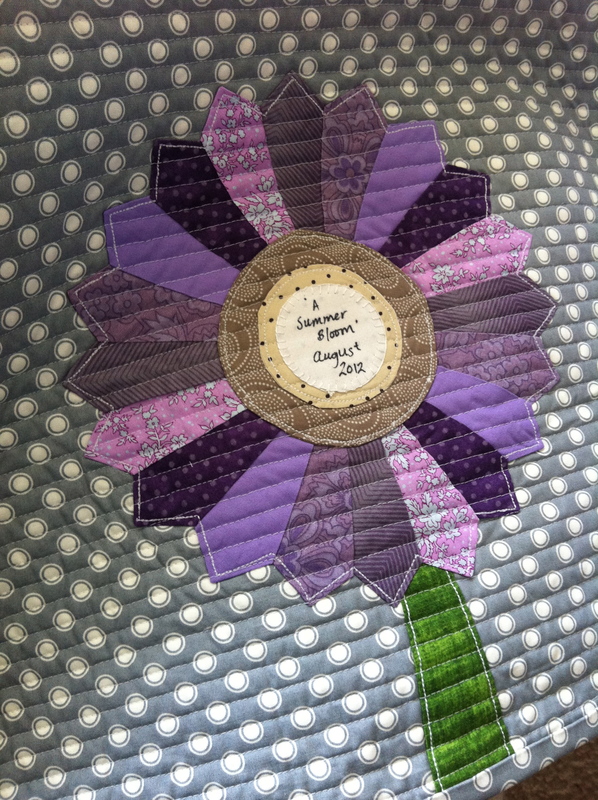 Thank you for sharing your beautiful quilt on pin. The stats of the quilt was very helpful. I used my new toy “Go baby accuquilt” for this quilt. Hopefully my quilt will turn out as beautiful as yours. It’s a pleasure to be able to share my quilts and instil inspiration! I am making this pattern as well. You can see my efforts at: http://www.artquiltmaker.com/blog/2014/12/revisiting-the-stepping-stones/ This is actually my second use of this pattern. I like the design. I really like your fabric choices. It is a great use of those Denyse Schmidt fabrics. The grey and white you used make them look cheerful. Hi Jaye! Thanks for visiting my blog! I had a look at the block you’re making and I love it! Those fabrics together are looking really great! I love all of the fabrics by Bonnie and Camille – they’re just so fresh, vibrant and fun! I am glad I ran across your blog! I love the Bonnie and Camille fabrics as well, though they needed a bit of a spark, so I added some other fabrics in those colors to give them a boost. I am trying to be very controlled in this version as my previous attempt got a little mushy looking. Hi Jaye! I can definitely relate with the ‘mushy looking’ analogy! 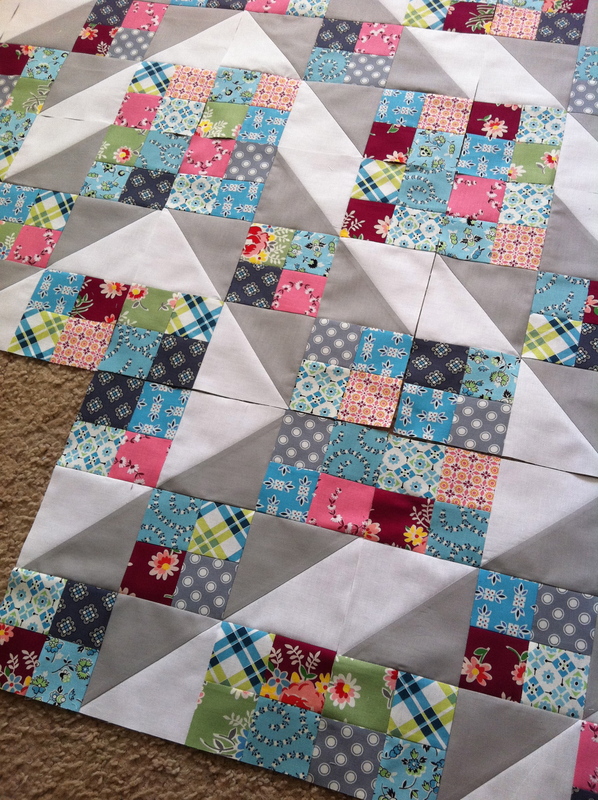 Nine times out of ten, I’ll end up with a finished block that looks too busy and just plain wrong! Since I can’t seem to tell my son and his family ‘no’, I will now be making two quilts this year’s Christmas. I really like the first pattern, and I wonder I you could give me an idea of how much fabric will be needed for the triangle squares. I’m going to use jelly rolls on the rest. Hi Karen! Thanks for stopping by my blog! Wow, you’re making two quilts for Christmas! Gosh your family is lucky!! It’s been a while since I made this quilt but I believe I used AT LEAST 1 metre/yard of fabric of the white and grey solid fabrics. beautiful.” I never made a quilt before, I would love to make this one. Hi Amanda. My question is.. you tell how many 2.5 inch blocks needed for the Jacob’s Ladder quilt in gray and white as main colors, but what size are the 64 HST’s. I also wasn’t sure about yardage for the gray or white so I purchases 2.5 yards of each. I always can use extra fabric, but want to be sure I purchased enough. Sorry for my late reply, I’ve just come back from a two week holiday! 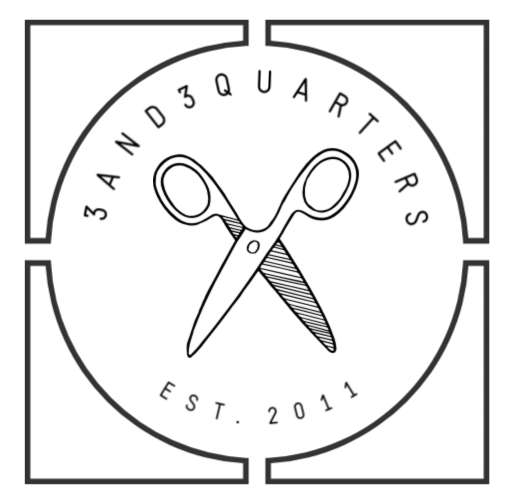 For the white and grey squares, you will need to cut 32 squares measuring 4&7/8″ from each fabric. Then cross cut them once so that you end up with the 64 HSTs. Thanks Amanda. I had figured it out by time I heard from you, and I’m working on my blocks! I would love to teach a quilt like this at my local quilt shop. Is there a pattern available? The pattern I used was from the Craftsy class, ‘Magical Jelly Roll Quilts’, where one of the lessons was making the Jacobs Ladder Block. Thanks for the reminder of Jacob’s Ladder quilt. I’m going to bring it to my quilting group for the homeless shelters. Jacob’s Ladder is one of my favorite quilt patterns. Thank you for sharing your lovely quilt! It’s one of my favourites too – all the possibilities!! I love your Jacob’s Ladder Quilt. You’ve inspired me with a plan for my next project. 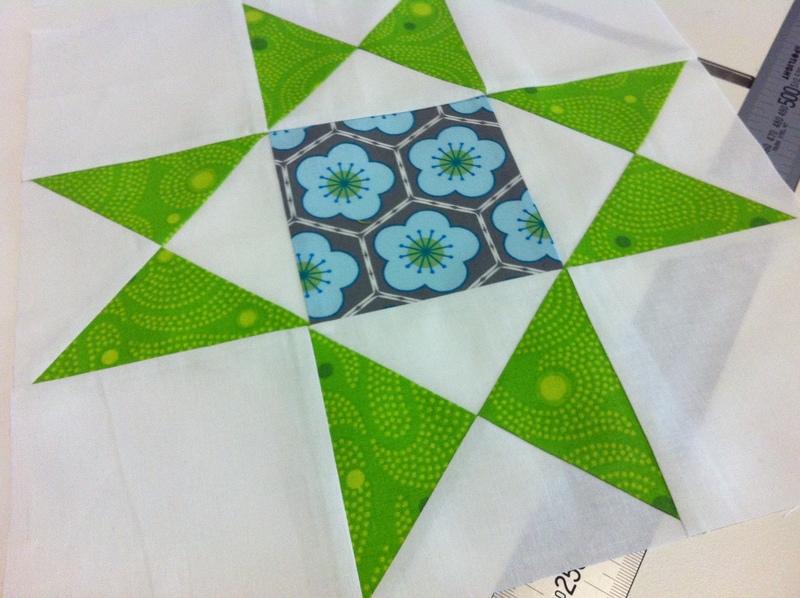 I wish you the very best of luck with your own Jacob’s Ladder Quilt plans! So very cool! I love patterns like this, because it is easy to make them with English Paper Piecing. Now to find the fabric!! Love your Jacob’s Ladder quilt. Seems like I’m seeing alot of gray in quilts lately. I like that trend.